After many years and several big names attached to the latest film adaptation of James Thurber’s 1939 short story have come and gone, The Secret Life of Walter Mitty finally got its much anticipated release this holiday season. 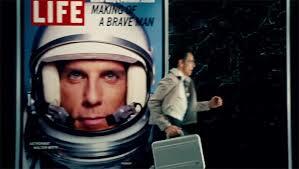 Director Ben Stiller stars as Walter Mitty, a shy “negative assets manager” (fancy name for picture developer) for LIFE magazine (In the world of this movie, LIFE is still a print publication. In actuality, it went online- only back in 2007). Walter leads a quiet life, works hard, and puts others before him. He saves his money to pay for his mother’s (Shirley MacLaine) move into an assisted living apartment, and also supports his sister (Kathryn Hahn) while she attempts to make it as an actress. Walter has few friends and no significant other. He crushes on a new employee at work, Cheryl (Kristen Wiig with Zooey Deschanel bangs), but has trouble mustering up the courage to “wink” at her on eHarmony, let alone talk to her in real life (which would actually be far less creepy). As an escape from his mundane and introverted existence, Walter frequently has daydreams that are so intense and vivid he “zones out” and gets lost in them. Because of this, many of his coworkers think he’s a bit off. But in Walter’s fantasies he is everything he’s always dreamed of being: fearless, a hero, an adventurer, Benjamin Button (yeah, that one’s kind of weird). There are changes a-brewin’ at LIFE, and just like in real-life the magazine is about to cease production in print and go virtual. Of course, this means a restructuring of personnel. The company brings in a group of insensitive bearded jerks led by Ted Hendricks (Adam Scott) to do the dirty work. While all the employees wait on pins and needles to find out if they still have jobs, a package arrives for Walter. It’s from the magazine’s star photographer Sean O’Connell (Sean Penn), an eccentric daredevil who has built a relationship with Walter over the years, trusting only him with his work. O’Connell is basically everything Walter dreams of being. He lives in the moment, by his own rules, traveling the world going to dangerous locations all to get the perfect shot. Let’s just take a moment to appreciate the humor of Sean Penn playing a photographer. In the package is O’Connell’s latest group of negatives including one very special shot that he feels is the best work of his career and would be just perfect for the last cover of LIFE. There’s only one problem. Walter can’t seem to find it. The beards have already gotten word of this diamond of a photo and are eager to see it. Concerned about his already shaky job security, Walter stalls them while attempting to locate the negative and O’Connell, whom he thinks must have forgotten to include it. Tracking down the elusive photographer is a feat much easier said than done as he doesn’t carry a cell phone or have a permanent address. Walter learns he last jetted off to Greenland and soon finds himself contemplating going after O’Connell there himself. This sets off a chain of events more incredible than anything Walter can ever dream up. Throughout his long career behind the camera, Stiller has never been taken as seriously as a director as he deserves to be (say, as in comparison to that other actor/director named Ben). Walter Mitty should prove any remaining naysayers wrong. 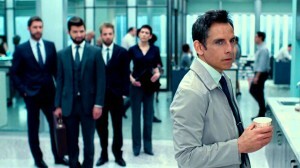 Stiller is very much in control and does an outstanding job bringing his vision to the screen. And what a vision it is! 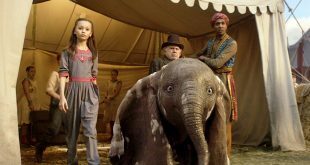 From the large corporate LIFE offices to the gorgeous exotic locales of Greenland, Iceland, and the Himalayas, every shot is stunning (credit is also due to cinematographer Stuart Dryburgh). 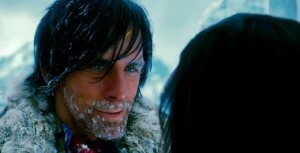 Along with an eye for detail, Stiller also has an ear, pairing a wonderful soundtrack to match each shot perfectly. 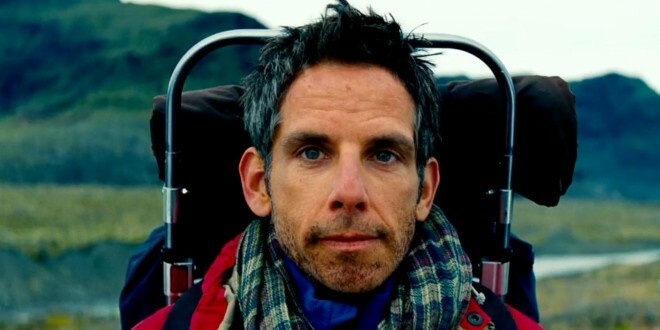 Likewise, while he is one of the most successful comedic actors, Stiller’s had difficulty breaking through in dramatic roles. Here again, he does a great job with his Walter Mitty, portraying him as a sympathetic and likable character you just can’t help but root for. The supporting cast does a fine job as well. Kristen Wiig isn’t given a whole lot to do, but shines in her every scene. Though we never really get to know her Cheryl that well, it seems perfectly understandable that Walter is so smitten with her. Patton Oswalt “shows” up as an eHarmony rep that befriends Walter through many status-update phone calls. Shirley MacLaine and Kathryn Hahn are great as Walter’s mother and sister respectively. Adam Scott’s character is a one-note caricature, but he plays it to a tee. And Sean Penn’s tiny bit of screen time is the best performance of the entire film (not much of a shocker there). There are some quirky bits of humor thrown into the mix, and most of the time they work, (Not the Benjamin Button one. Seriously, was that a leftover sketch from Saturday Night Live they just threw in at the last minute?) giving the film an offbeat feel that somehow fits. When I first saw the trailer for this movie a couple months ago, I was absolutely wowed and couldn’t wait to see it. I expected to come out of this film moved to tears and inspired to quit my job and go zip-lining in the jungle. Or something like that. While it’s a sweet story and beautiful to look at, I never really felt anything more. Something about it just never clicks the way it should. Maybe it’s because of how quickly Walter morphs from a timid little office drone to a death-defying/shark-fighting/skateboarder extraordinaire/superhero. In the first examples of his transformation, it’s hard not to wonder if these are just more of his fantasies, but it’s soon clear they are not. It changed my perception of the character, which was probably intentional, but it all just felt a little far-fetched. It’s a nice idea to give the character of Walter Mitty (originally written as a loser who has given up on any hope for a fulfilling life) a chance to finally get to experience the types of things he’s been forever dreaming about though. It becomes almost two movies using Thurber’s story as a springboard for Mitty’s real-life adventures which play out as kind of a National Treasure meets a male Eat, Pray, Love. But nowhere near as annoying as Eat, Pray, Love. Nothing will ever be as annoying as Eat, Pray, Love. Maybe it’s that instead of letting the sentimental moments develop naturally, they are presented free of subtlety. I often felt bashed over the head with the countless “FEEL THIS” montages of Walter walking/running/skateboarding to swelling music. This may sound a little contradictory to my previous praise for these very moments, but while in and of themselves they are very well-done and effective, a little of this type of thing goes a long way. Maybe it’s that near the end of the film, a satisfying conclusion was reached which I thought was the end. But then it wasn’t and it kept going a little more, and more, and more, tying up everything a bit too perfectly with a pretty little bow. Maybe it’s a combination of all of those things. The product placement. Oh man, the product placement in this one. The LIFE thing, fine. 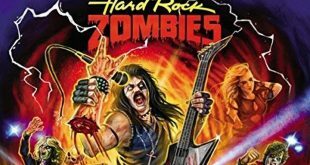 That makes sense and the magazine’s motto “To see things thousands of miles away, things hidden behind walls and within rooms, things dangerous to come to, to draw closer, to see and be amazed” fits in nicely with the film’s theme. Even the eHarmony bit provided a fun running gag (and any opportunity to involve Patton Oswalt is a good thing), but it would have been no different with a fictional dating site. And then there’s Papa John’s. And Cinnabon. When product placement is so blatant that it takes a viewer out of the story long enough to roll their eyes and mutter “ugh,” then it’s too much. 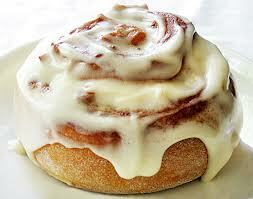 Fun Fact: One time I missed a connecting flight because I lost myself in a Cinnabon. True story. 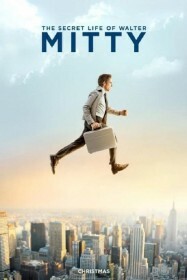 It’s a little disjointed, but The Secret Life of Walter Mitty is entertaining and enjoyable with solid performances and spectacular visuals. 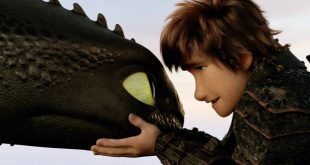 At times it overreaches in the sentimentality department but overall is a good-hearted and uplifting time at the movies. Which, this holiday season, is something everybody could use. Take a Drink: whenever Walter zones out into a fantasy. Take a Drink: every time Adam Scott’s character says something douchey. Take a Drink: at every inspirational montage of Walter walking or running with motivation. Take a Drink: at the coolest beer mug ever! Take a Drink: every time someone has a beard. Take Two for Walter. Do a Shot: PRODUCT PLACEMENT!